Taking a major step forward in turning jails into reform centres, the Punjab Jail Department has launched a de-addiction campaign in its prisons as a pilot project at jails in Kapurthala and Bathinda. Once successful, it will be replicated in other jails of the state as well. Taking a cue from Hollywood sports comedy “The Longest Yard”, featuring wrestler Khali, that showcases a sporting match between jail officials and prisoners, the Punjab government has planned the same. But, for thousands of inmates lodged in Punjab jails, there is more in the offing. The political fervour of many candidates in the election fray is now being replaced by fear of the Income Tax authorities. The affidavits declaring assets of candidates are under the I-T scanner. Sources in the Income Tax department said 92 candidates in the election fray never filed their tax returns. Here’s a reality check for a state that figures high on the Education Development Index of the country: a government school in Chief Minister Parkash Singh Badal’s home district functions from a room. Three days after the brutal killing of Moga DSP Balraj Singh Gill and Monica Kapila, an industrialist's wife, the police today questioned a woman friend of the victim (Monica) and a male doctor. The Electoral Reforms Campaign Committee, constituted by NGOs, to look into reports of thrashing of a pregnant woman reporter and the alleged denial of voting in several polling booths has recommended a re-poll at booth No. 137 in Nabha. Senior Congress leader and trade unionist MM Singh Cheema today met Congress President Sonia Gandhi and informed her about the current political situation in the state. Chief Minister Parkash Singh Badal today blamed the Congress-led UPA government for “deliberately” delaying the elections of the SGPC office-bearers. With elections to the Delhi Sikh Gurdwara Management Committee (DSGMC) a little more than a month away, the ruling Shiromani Akali Dal (Delhi), led by Paramjit Singh Sarna, has announced the launch of Guru Harkrishan Health Insurance Scheme for economically weaker Sikh families of Delhi. The Punjab unit of the BJP has questioned the “silence” of the Congress on the 2G spectrum scam by saying that the Punjab Pradesh Congress Committee (PPCC) constantly alleged that the SAD-BJP was corrupt. Head of Dera Sachkhand Ballan Sant Niranjan Dass and thousands of followers of the dera boarded the “Begampura Express” at Jalandhar city railway station this afternoon for reaching at the birth place of Guru Ravidass at Seer Gowardhanpur in Varanasi to participate in the celebrations of his 635th birth anniversary on Monday. After three independent inquires by the police, district administration and the Punjab School Education Board (PSEB) found that a private school in Kotkapura had been preparing fake salary statements, the Punjab Lokpal has directed its IG to conduct a further inquiry to nail the erring officials. After the state Department of Water Supply and Sanitation confirmed the high concentration of uranium in 241 out of a total of 1,260 water samples gathered from various districts of the state. 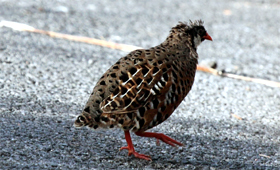 Domestic bater (white quail) attracts non-vegetarians of the state for whom it is a choicest delicacy. The Animal Breeding and Genetics Department of GADVASU in Ludhiana sells more than 4,000 baters every year at the poultry farm on the university campus. The Punjab State Human Rights Commission (PSHRC) has sought a detailed report from the Muktsar DC regarding pre-winter outbreak of dengue, which reportedly caused seven deaths and affected nearly 5,000 others. Punjab Governor and Chancellor of Punjabi University, Patiala, Shivraj V Patil has called upon the youth to identify real problems plaguing the society and find solutions to raise a new India of our dreams. Within days after polling in Punjab on January 30, power cuts are back in both domestic and commercial sector. Information available from various parts of the state shows that for the domestic category consumers, power cuts vary from half-an-hour to two hours daily. The Health and Family Welfare Department, Patiala, has decided to send a notice to Bollywood actor Om Puri for smoking at a public place in Rajpura on Friday. Debate on Lokpal notwithstanding, retired bureaucrat Manohar Singh Chandla has come out with his book based on research blaming the Lokpal for ruining the Sikh empire. 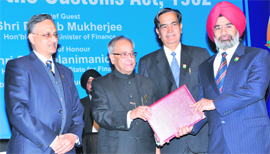 Chief Commissioner of Customs and Central Excise and Service Tax in Chandigarh, PS Pruthi, receives the World Customs Organisation Certificate of Merit from Finance Minister Pranab Mukherjee on the occasion of International Customs Day in New Delhi. Hitting hard at Punjab’s former top cop KPS Gill, the Punjab Public Service Commission has claimed that his petition for inquiry by a special investigation team into the selection of medical officers in Punjab was motivated. A local court today issued a notice to the investigating officer of the Punjab Vigilance Bureau to bring on record various documents pertaining to the investigation in the fertiliser scam. After a period of more than six years, the local police finally filed a challan against 22 Dal Khalsa activists in a sedition case registered against them on June 8, 2005. Six of the accused, including Dal Khalsa's secretary general Kanwar Pal Singh, appeared before the trail court of CJM Kuldeep Singh today. A minor girl, Madhu, allegedly committed suicide by jumping into a reservoir at Gidderanwali village of Abohar subdivision. In a complaint lodged with the Khuyiansarwar police, her father Onkar Nath alleged that one Sanju had been teasing Madhu (15) for the past few weeks. Revealing this after visiting the Central Jail here today, DGP (Jails) Shashi Kant said, "The campaign is need of the hour as out of the 18,000 jail inmates in the state 12,600 are convicts of which 60 per cent are drug addicts. We also thought that the jail inmates can be de-addicted as they are insulated from the rest of the world and hence their chances of falling prey to the menace again are less". He also disclosed that they were using methadone syrup for de-addiction of inmates, which was the first ever instance of the syrup's use in India. "Methadone is being used in various countries like Maldives, Nepal and Bhutan for de-addiction for years, but the Drug Control Department only recently gave a go ahead for its use in our country". He said the de-addiction course would last for three weeks for a jail inmate at the de-addiction centres set up inside jails. He said 10 beds in the 50-bed hospitals in the three newly-built jails of Kapurthala, Mansa and Faridkot had been kept reserved for the inmates joining the de-addiction programme. According to the DGP, two inmates in Kapurthala jail have already been administered a dose of methadone while 10 others have come forward for the treatment. He said there were four partners in the campaign, United Nations Office on Drugs and Crime (UNODC), Union Government, Punjab Health Department and the Punjab Jail Department. "We have also roped in NGOs at the national level and will be holding various seminars and conferences on the issue." On the issue of cutting the supply of drugs into the jail premises, Shashi Kant minced no words in stating that the supply had reduced but not stopped altogether. He also admitted that some of the jail department employees were also involved in it and they were trying to identify them. "I have already suspended and even dismissed some errant staff and I would not hesitate in doing so again. Any sort of involvement of jail staff in supplying drugs inside a jail will not be tolerated," he warned. On security issues, the DGP said they had installed jammers in high security jails to check misuse of mobiles in the prisons, besides extending videoconferencing facility to simplify the cumbersome process of appearance of undertrials in the courts. Ex-servicemen would be roped in for boosting the security of jails, adding that they would soon be recruiting 1,000 staff members for the purpose. On overcrowded prisons, he said the jails in Punjab had 18,000 inmates against the sanctioned capacity of 15,000. The new prisons that were coming up had more capacity while land and fund crunch was hitting the expansion of existing jails," he added. To promote anti-drug measures, the government has formed a policy to promote physical fitness among jail inmates through sports. The policy provides for holding of inter-jail sports competitions. For this, sports equipment and gymnasium facilities will be provided to the inmates. Initially, inter-ward competitions will be held and later, the best squads will be selected to participate in the annual inter-jail competitions,” said jail officials. The sports model has been framed after its success in the Central Jail, Patiala. “During his recent visit to Patiala Central Jail, DGP (Jails) Shashi Kant saw the inmates participating in sporting activities. He now wants to promote sports in all jails,” said Rajan Kapoor, Deputy Jail Superintendent, Patiala. Talking to The Tribune, Shashi Kant said sports would help the authorities achieve twin goals. “We will make the inmates busy in sports which will also promote physical fitness in them”, he said, adding that a national gymnasium chain had been approached to open gyms inside the jails. “From the current year, we will come out with an annual sports calendar for the inmates. We have also planned to involve sports teams from the corporate sector, media, NGOs and administration,” claimed Kant. At present, Punjab has seven central jails, five district jails, two open air jails (Nabha and Kapurthala), one women’s jail (Ludhiana) and 10 sub-jails. Besides, there is a Jail Training School in Patiala. Cutting across party lines, these candidates have assets worth crores of rupees as declared in their affidavits at the time of filing of their nominations. As many as 47 contestants do not even have a PAN number. Officials in the Income Tax department informed The Tribune that assessing officers in each district have been told to compile a report of such candidates. The officers have also been told to calculate the tax evasion by these candidates and start investigations. A report on these 92 candidates will be sent to the Chief Commissioner of Income Tax, who will then forward it to the Election Commission within six months. Three such candidates with maximum assets are Karan Kaur Brar, a contestant from Muktsar. He has declared assets worth Rs 128 crore. Ramanjit Singh Sikki, a contestant from Khadoor Sahib, has assets worth Rs 20.12 crore; and, Gurpartap Singh Wadala, a candidate from Nakodar has assets worth Rs 13.71 crore. Income Tax officials said though the department had seized unaccounted cash of Rs 12 crore during its routine checking, none of the seizures was linked to any political party or candidates in the fray. “The cash recovered from each person is being deposited against his name. When such a person from whom this cash is seized files his annual returns, this amount will be included as his income and tax deducted,” said the official. The students at Government Primary School, Pakki Tibbi, on Delhi-Abohar national highway, about 14 km from Malout, are forced to sit on the floor. The school has only two chairs and a mattress. Its reverse osmosis (RO) plant was shut down a year ago. The playground has turned into a dumping ground with a thick layer of fluoride spread over it. And the school doesn’t have a boundary wall - it collapsed a year ago. This is despite the government claims of having spent a whopping Rs 60 crore on the furniture of government primary schools across the state in the last four years. There is just one teacher, who is also a Sikhya Karmi recruited under the Sarv Shiksha Abhiyan, who holds all the five classes. The woman, identified as Vandna, is said to be a close friend of Monica. The doctor whose identity has not been disclosed yet was also an intimate friend of Monica. During the questioning, Vandna said DSP Gill had concealed his identity and posed as Aman Verma, an industrialist. Monica was all praise for Verma's (Gill's) gentle demeanor, Vandana told the investigating officers. Vandna was shocked when she came to know that Verma was none other than Moga DSP Gill, revealed a police source. The victim's friend said the DSP got late in arriving at the farmhouse. In the meantime, Monica rang up Vandna and told her that she was roaming around the Golf Link area in her vehicle and waiting for Verma (DSP Gill). The sources said the call details procured by the police had showed that the duo used to exchange frequent messages. However, there is no record of any long telephonic conversation between the two victims. The sources said as the DSP was "concealing" his identity that was perhaps the reason why he did not carry his service revolver on that ill-fated day. Additional Deputy Commissioner of Police Kulwinder Singh said, "The assailants were more than three in number. Practically, if they were chasing a woman, they might be on a vehicle. After killing the victims, they took both the vehicles. That indicates that three or more persons are involved in the crime". The police today formed special teams to expedite the investigation of the case. On the other hand, the Moga police has also launched a parallel probe into the incident. Meanwhile, during the bhog ceremony of the slain DSP, relatives and friends rebuffed the allegations of DSP's links with Monica. They said baseless stories were being made to malign the image of the DSP and the woman. "Everyone is concocting stories. My son had no involvement with Monica Kapila. The case appeared to be part of some major conspiracy hatched to kill my son and to malign the image of the family. It could also be a ploy to divert the line of investigation of the police in this case," said Kashmir Singh Gill, Balraj Singh Gill's father. The panel said local politicians largely succeeded in hampering fair polls. It noted that there were complaints that 597 voters in booth 136, 748 in booth 137 and 659 in booth 139 were not allowed to exercise their democratic right. The committee recommended a judicial probe into the assault on the woman journalist, Harvinder Kaur Nauhra, by a local henchman of a politician, identified as Surinder Chauhan and his son Yadvinder Singh Chauhan. It said disciplinary action should be initiated against the polling party and security personnel on duty who failed to maintain law and order. The committee was formed under the chairmanship of Dr P.L Garg, a former registrar of Baba Farid University of Health Sciences. The committee formed at the behest of a group of NGOs monitoring the Punjab elections had among others Manjit Singh, Professor of Sociology,Punjab University, Malwinder Singh Mali, a prominent social activist and others. The report will be presented to CEO Punjab, Kusumjit Sidhu, on Monday. The committee’s fact-finding team found a lot of resentment among residents living near several polling booths. The residents alleged they had been ignored by successive governments. Cheema is learnt to have told the party chief about the role of various party leaders during ticket distribution when many deserving candidates were left out. Cheema said he thanked Sonia Gandhi for making a whirlwind tour of Punjab despite bad weather. She had deputed Rahul Gandhi, Union Minister Ambika Soni and Haryana Chief Minister Bhupinder Singh Hooda, which “tilted the balance in favour of the Congress.” “A personalized campaign of Captain Amarinder Singh played a decisive role,” Cheema said. Talking to mediapersons after paying obeisance at the Golden Temple, Badal said the SGPC elections were held four months ago while the notification regarding the new members was issued one-and-a-half month ago. He alleged that the Congress had been earlier unnecessarily interfering in the Sikh affairs and was again doing the same now. He urged the Centre to call a session of the SGPC House at the earliest for electing its office-bearers so that the premier Sikh body could run its affairs smoothly. On the "sehajdhari" issue also, he said it was the Centre's job to turn the notification into law. He dubbed the Sehajdhari Federation's demand of appointing a receiver as unfair. On the DSGMC elections slated for March 11, Badal claimed that like the SGPC elections, the SAD would sweep these elections also. Replying to a query, he said their main contest in the DSGMC polls was with the Congress and not Paramjit Singh Sarna. He alleged that Sarna was a proxy of the Congress and therefore, the direct fight was with the Congress. The Chief Minister also claimed that the SAD-BJP alliance would get a clear majority in the assembly elections. He said the Election Commission had played its role well and had ensured free and fair polls in the state. The announced cashless scheme will initially provide total health cover to 25,000 families or about 1.25 lakh persons in total “Sikhi swaroop” through 150 hospitals, healthcare centres and clinics, both in the public and private sectors. While the ruling SAD (D) faces tough opposition from the Shiromani Akali Dal (Badal) for managing historic Sikh gurdwaras in the union capital, elections to 46 wards that send one representative each to the 51-member DSGMC general house, are expected to witness fierce contests this time. The remaining five members are nominated. Even the SGPC also nominates a member on the DSGMC. The last elections were held in January 2007. Though the term is of four years, the elections have been delayed by a little more than a year this time. 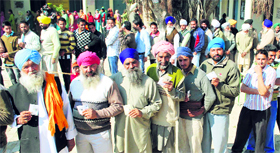 Elections will be held on March 11, five days after the results to the Punjab assembly elections are declared. Since the model code of conduct will remain applicable in Punjab till the counting of votes, most of the senior leaders of the SAD (B) would be free to campaign in Delhi. Though both the SGPC and the DSGMC are governed by the Central Acts, both have a different definition of a Sikh who can vote in the gurdwara elections. While “sehajdhari” Sikhs remained barred for participation in the SGPC elections held in September last year, there is no such confusion in Delhi where all those who believe in 10 Sikh gurus and Guru Granth Sahib and are prepared to give an undertaking to that effect are treated as Sikhs, even if they have shorn hair. When Paramjit Singh Sarna announced the launch of the new cashless health insurance scheme, he made it clear that benefits of the scheme would go to only those Sikhs who maintain complete “Sikhi swaroop”. Meanwhile, the DSGMC has also entered into an agreement with Radiant BL Kapoor Hospital for starting Guru Harkrishan Hospital. The DSGMC would get Rs 25.5 crore from the management of Radiant Hospital for utilisation in areas like education and for the benefit of the weaker sections of society. Surprisingly, PPCC president Capt Amarinder Singh and no other Congress leader has said anything about the Supreme Court’s verdict against the UPA government in the 2G scam, said Ashwani Sharma, state president of the BJP. Questioning the silence, Sharma asked what implication should people draw from this silence? Coming down heavily on the PPCC chief, Sharma said that Capt’s silence speaks all. “The PPCC chief is with corrupt and if he is not then he should clear his stance on the issue,” he said, adding that the decision-making process of the UPA government had come under severe indictment of the Supreme Court. This was the third decision exposing serious infirmity in the decision-making process of the UPA Government, he said. The first was related to the appointment of former CVC PJ Thomas, which was quashed by the Court. The second was related to the gross delay of 16 months in granting sanction to prosecute the then Telecommunication Minister A Raja, wherein the Supreme Court had strongly commented against the PMO of inaction. “Obviously, any idea of the PMO without PM is unthinkable and now comes the decision wherein 122 licences have been quashed,” he said. Earlier, a “shobha yatra” was also carried out from BMC chowk to the railway station by the dera followers. There was a huge rush of devotees and a large number of them boarded the train. Tight security was made on the route of the yatra and at Jalandhar city and cantonment railway stations to avoid any untoward incident. The earlier inquiries have found that while the teachers were actually paid Rs 700 to Rs 1,500 per month, the school claimed of paying them Rs 4550 to Rs 5,480 in the salary statements submitted to the PSEB. Moreover, in the salary statements submitted to the Employees Provident Fund Organisation, the school mentioned the salaries as Rs 350 to Rs 500 per month. The school had been preparing three different fake salary statements for saving the money and misleading the PSEB to get permanent affiliation, thus depriving the teachers of their due. In the salary statements submitted to the PSEB, the school claimed of paying the teachers in the bracket of Rs 4,550-Rs 5,480, the minimum fixed wages, but the salaries were showed much less to the EPFO as it is mandatory for the schools to pay 12% of the salary as EPF contribution. However, due to school managements' "connivance" with some senior officials in school education department, no action was taken against the school, alleged Vipan Kausal, a Kotkapura resident, in his complaint to the Lokpal, which has directed its IG to conduct a detailed inquiry to nail the guilty education department officials. After the state Department of Water Supply and Sanitation confirmed the high concentration of uranium in 241 out of a total of 1,260 water samples gathered from various districts of the state, now the Bhabha Atomic Research Centre (BARC), Mumbai, has been entrusted with the task of finding out whether the presence of this radioactive material is responsible for the high prevalence of cancer in the Malwa region. During the hearing of a public interest petition a few days earlier, the state government submitted the water sampling reports about uranium presence in the Punjab and Haryana High Court. As the petitioners in this case and the state government have had divergent opinions about the high uranium presence adversely affecting human health, the high court has sought BARC’s opinion to know about the causes of high uranium presence and high cancer prevalence in the area, said Dr GS Dhillon, a Consulting Engineer in the Water Resources Development Project in Punjab. Two months ago, eight senior scientists from BARC and Guru Nanak Dev University, Amritsar, had released a full-length research paper on geochemical modelling of uranium speciation in the subsurface aquatic environment of Punjab. It reinforced the earlier studies and confirmed the high concentration of uranium in groundwater in the Malwa region. Now, Dr Dhillon has requested BARC to identify the causes and adverse affects of high uranium presence in the area. “We are hopeful of BARC submitting its findings on February 15, the date of the next hearing in the High Court,” said Dhillon. “As the presence of high radioactive material in the water and soil in Bathinda, Faridkot and Ludhiana districts of Punjab is adversely affecting the people, there is an urgent need to find out the sources of leakage of uranium into drinking water. “Also, steps are required to check its spread,” said Brijender Singh Loomba, a Mohali resident and the first petitioner in the high court on the uranium issue. However, bater rearing as a commercial venture is yet to catch up in the state. University researchers feel that the rearing of baters could be a profitable undertaking, but not many came forward to foray into this venture. According to the university authorities, most people visit the university campus for purchasing baters for meat purposes. Even those on the lookout for employment avenues let the suggestion of bater rearing fly past them. They are able to digest the bater meat, but unable to digest the idea of bater rearing as a vocation, says a university official wryly. The bater meat is rated as a delicacy in Punjab. In the local tradition, the quail meat and eggs are considered as therapeutic for joint pain, anaemia, diabetes and asthma, tuberculosis, sexual and nervous disorders. Earlier, the people from the rural Punjab would hunt desi baters (hunting is now banned) from the fields and serve the meat to special guests. That is why the local species of bater is now nearly extinct. The Punjab white quail was developed by the university in 2007. The work on the genetic improvement of the quail was started in 1991 at PAU in Ludhiana, whereby a coloured breed of quail was developed. Dr Iqbal Singh Bajwa, Head of Department of Animal Breeding and Genetics Department, GADVASU, said, “The quail meat, on per-unit meat basis, is rich in protein, minerals and some vitamins, and low in cholesterol. The white quail attains an average body weight of over 250 g in five weeks”. He added, “Bater rearing can be taken up commercially, provided you have got your basics straight. You have to take extra care of the chicks in the initial stages as it is the most critical time”. Kulbir Sekhon, a practicing lawyer at the Punjab and Haryana High Court, and a native of Muktsar, had filed a complaint with the commission in October 2011, seeking its intervention in the matter. While presiding over the 35th convocation of Punjabi University here today, Patil told the students, "If you are positive, results would be positive in all things you do and if your approach and attitude is negative then the results would also be disappointing." During the convocation, Patil conferred honorary degrees upon eminent environmentalist Balbir Singh Seechewal, noted educationist Dr JM Waghmare and celebrated painter and sculptor Sidharth. He also awarded 177 PhD degrees to students, who completing their doctorate from the varsity. 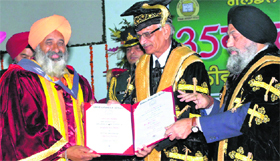 University Vice-Chancellor Dr Jaspal Singh conferred three M Phil, 82 post-graduate and professional and 22 undergraduate degrees upon the passing-out students. Karan Bhalla of M Sc chemistry was presented the Chancellor's Medal for her overall best performance in academics. Delivering the convocation address, Dr Pankaj Chande, president, Association of Indian Universities, said that the biggest contribution of India to the world was the institution called 'university'. Discussing about the higher education, he said that the population of qualified youth in Europe, Australia and America has come down to as low as 35 per cent. "To run their countries with full productivity, they will have to attract skilled graduates from rest of the world. To bridge this gap, they have to depend on qualified, skilled and disciplined brains from abroad. The present international picture clearly favours India and China to fill this void", he said. Dr Paramjit Singh Jaswal, Vice-Chancellor, Rajiv Gandhi National University of Law, and Dr Dalip Kaur Tiwana, eminent Punjabi litterateur, were the guests of honour on the occasion. Within days after polling in Punjab on January 30, power cuts are back in both domestic and commercial sector. Information available from various parts of the state shows that for the domestic category consumers, power cuts vary from half-an-hour to two hours daily. However, for the industry the Punjab State Power Corporation Limited (PSPCL) has imposed power regulatory measures. As per the circular issued by the PSPCL, one-day weekly off has been imposed on the general industrial consumer, whereas two-day weekly off on arc/induction furnaces and rolling mill consumers. Though, the authorities of the PSPCL are not ready to accept that there has been any unscheduled cut in the domestic sector, but there have been reports of power cuts in residential areas of many districts, including Ludhiana, Mohali and Patiala. As per the figures given by the PSPCL, the total demand of power recorded on Friday was 1,000 lakh units (LUs), whereas the availability was 950 LUs. Officials said that the present power crisis was due to sudden spurt in the power demand from agricultural pumpsets. “In the meantime, the demand from the agriculture sector also went up to 200 lakh units. Because of these things, there has been a shortage of power, but it is temporary," Arun Verma said. However, not convinced with the views of the Power Corporation authorities, industrialists said that it was 'mismanagement', which creates the problem of power shortage. "Even if we agree that power demand has gone up because of agriculture sector, the PSPCL can easily bridge the gap by purchasing power from outside the state, as the current frequency at the northern grid is 49.93 and the price per unit of power is just Rs 2.17", said Badish Jindal, president of the Federation of Punjab Small Industries Association. Puri was in Rajpura to attend the Sardar Patel International Film Festival. On the sidelines of the festival, Puri was allegedly caught on camera smoking at a public place and his photograph appeared in one of the vernacular dailies. Civil Surgeon Dr VS Mohi said, "Before taking any action in this regard, we wanted to seek the comments of Puri. I had sent a team headed by District Health officer Dr Bhupinder Singh and some other officials to a hotel on the Rajpura Road where Puri was staying. However, when the hotel staff informed that Puri had left for Mumbai. He said that now they would be sending the notice to Puri through the Mumbai Police Commissioner. Notably, in May last year, another Bollywood actor Salman Khan was caught smoking at a public place in Patiala during the shooting of his movie Bodyguard. Chandla belongs to that rare group of bureaucrats, who after superannuation take to serious research work and writing on issues that they normally avoided during their service tenures. Chandla, who joined the Provincial Civil Service at a time when “the builder of modern Punjab” Partap Singh Kairon was the Chief Minister, is also credited with training many civil servants of the state, including Kulbir Singh Sidhu who later came to be known as “Sikh centenaries specialist”. In fact, he started his career at a time when the Akalis were on an agitation. An attempt was made to break the Bathinda jail where a large number of Akalis were detained. The police came down heavily on the agitators and opened fire inside the jail premises. So Chandla learned the civil magistracy the hard way. He held several prestigious positions in his distinct career before ending up as a researcher and writer. As a student of history and comparative religion, Chandla has now come out with a book on the most-talked about subject, the Lokpal. Tracing history of the Dal Lokpal, the self-appointed watchdog of the Sikh Kingdom, he says it has been the Lokpal that killed the Kingdom. Besides a book on Baba Banda Singh Bahadur, Chandla is also credited with two well researched books on the life and religion of Jambhoji, the Bishnoi Community of Rajasthan and the Bishnois’ Wildlife Protection. In his latest book, he has tried to portray the plain tales of the Sikh Raj, especially after Maharaja Ranjit Singh, by dedicating chapters on Mai Sada Kaur, the “architect” of the Sikh Raj, Fateh Singh Ahluwalia, Maharaja Ranjit Singh, Dewan Mohkam Chand, Akali Phoola Singh, Faqir Aziz-ud-Din, besides Kharak Singh (an imbecile prince), Rani Isher Kaur (a reluctant sati), Sher Singh (victim of the follies) and Rani Jindan (a tragic end). The most interesting part of the book, however, is on Lokpal that author feels, ruined the Sikh Kingdom. Interestingly, book writing is confined not only to Punjab and retired bureaucrats. Even in neighbouring Haryana, Principal Secretary Dheera Khandelwal released her collection of poems “In Search of Stars” last week. Incidentally, the book has been published in English, Hindi, Punjabi and Urdu simultaneously. Claiming that the petition’s intention was to undermine the Commission’s independence and autonomy, it was added that the plea “has been filed with an ulterior motive, which is being used as a veil for the political and propaganda motives”. 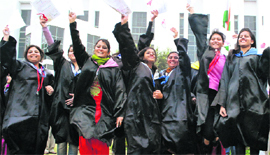 Indicating that the selection was fair, the PPSC asserted: “Medical specialists were drawn from different institutions outside Punjab and Chandigarh so that none of the candidates coming before them would possibly have been their students…. “The second issue pertains to interview of 45 doctors in 40 minutes. This is a completely misconceived fact and is out rightly liable to be rejected on the basis of record. A total of 90 candidates were interviewed by three panels per day. The assertion of the petitioner is thus devoid of any factual reality”. In 2001, the Vigilance Bureau had registered a case against a former Congress MLA and number of officials of the Agriculture Department on a complaint filed by Satnam Singh Behru of the Consortium of Indian Farmers' Association. Later, the Vigilance Bureau filed an application for closure of the case, but the complainant went to the court against the move. Behru has been demanding that Punjab government should hand over the case to the CBI. He had been instrumented in getting the case registered against the company owned by former Congress MLA Amrik Singh Dhillon. Behru had alleged that a large sum of money intended as subsidy was siphoned off in collusion with officials of the Punjab Agriculture Department and manufacturers, dealers and suppliers of the super phosphate fertiliser by forging records. In 1993-94, the Union Government had decided to extend subsidy to the manufacturers of the super phosphate fertiliser. In the case, the subsidy was claimed without manufacturing a single tonne of fertiliser and showed fictitious sale through forged documents with the help of officers of the department, who were to monitor the sale of fertiliser. 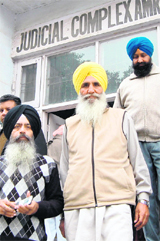 After a period of more than six years, the local police finally filed a challan against 22 Dal Khalsa activists in a sedition case registered against them on June 8, 2005. Six of the accused, including Dal Khalsa's secretary general Kanwar Pal Singh, appeared before the trail court of CJM Kuldeep Singh today. The court has fixed March 13 as the next date of hearing and has ordered all the accused to appear before it. The local police had on June 8, 2005 registered a case under various offences, including sedition, at Civil Lines Police Station against Dal Khalsa activists for organising a Genocide Remembrance March on the eve of 21st anniversary of "Operation Bluestar". The FIR was registered under sections 153-B, 153-A, 124-A, 188 of the IPC. In February, 2010, the accused had approached the Punjab and Haryana High Court and filed a petition praying for the quashing of the FIR. The case is still pending in the High Court and the next date of hearing is February 9, said Kanwar Pal Singh. He said the police today filed a challan under section 188 of the IPC whereas sanction to prosecute the accused under sedition charges from the Department of Home Affairs and Justice was still awaited. He further commented, "What had the government and the police been doing for all these years." He added that the march passed through the streets of Amritsar peacefully and culminated at Sri Akal Takhat Sahib. A number of policemen and intelligence operatives were in attendance to monitor the event although no incidents of incitement or violence occurred and no attempt was made to stop the march or make any arrests during the event, he claimed. Yesterday, her neighbourhood friend and classmate Rajni and her mother Janak Rani visited their house and allegedly mounted pressure on her to marry Sanju. When Madhu refused, the visitors thrashed her. Madhu later jumped into a reservoir. Her body was spotted last night. ASI Harbans Lal said Madhu’s body had been shifted to the Civil Hospital for postmortem. A case has been registered under Section 306 IPC against Sanju, Rajni and her mother Janak Rani. All the suspects are absconding.